The battle for supremacy for the top segment 'platinum' between Peterite Lakshina Rodrigo and Richmondite Charith Asalanka continue at the final stages of the Sunday Observer/Mobitel Most Popular Schoolboy Cricketer Of The Year 2015 contest. Lakshan and Charith Asalanka, both prolific performers during the 2014/2015 school cricket season have been in the forefront as strong contenders for some time and the final outcome of the contest will be known soon. In the 'Gold' segment Randev Pathirana of Royal College, Colombo is still in the lead and Ramindu Nikeshala of Devapathiraja, Ratgama is not so far behind. 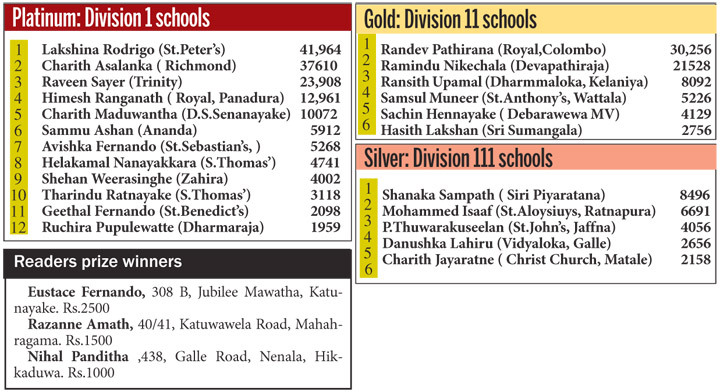 In the 'Silver' category for school splaying in division 111 Shanaka Sampath of Siri Piyaratana,Padukka is perched on top while Mohammed Isaaf of St.Aloysius, Ratnapura is placed second.